Iced coffee in Vietnam is iced coffee. I’m not talking about your run-of-the-mill watered-down-milk-more-than-coffee cup with the orange straw from Dunkin Donuts that you down once it hits 80 degrees. I know I may sound dramatic by saying, “I haven’t taste real coffee” until I went to Vietnam, but in a sense, I did. I rediscovered what coffee should taste like—an in-your-face, flavor-packed sensation. How many of you can say the same about Starbucks? It was all too perfect when my mother informed me that my aunt in Vietnam owned a two-story cafe. In the craziness that is Ho Chi Minh City, the presence of coffee is a constant in Vietnamese culture. Elderly men sit outdoors sipping iced coffees in the morning from their plastic beach chairs, watching dusty streets and speeding mopeds. At night, families congregate outdoors for fresh air at small plastic tables and chairs, buzzing and socializing. At my aunt’s cafe, sports fans crowd outside around wooden tables anxiously sipping their coffees while watching football (aka soccer). During Ho Chi Minh City’s hottest time of the day (between 12 and 4pm), I huddled indoors in my aunt’s air-conditioned cafe to avoid the heat waves, with at least two glasses of iced coffee. Unlike China’s tea tradition, Vietnam adopted a coffee culture from the French colonization in the 19th century. Today, Vietnam is the second largest exporter of coffee after Brazil. Most coffee grown and brewed in Vietnam is made with bold Robusta beans, rather than Arabica beans typically used in European-style espresso. Slowly roasted over low heat until they have a dark and oily exterior, robusta beans have a rich, full-bodied flavor with a hint of chocolate. What is this contraption on top of my mug? This is a phin, a single cup metal filter. 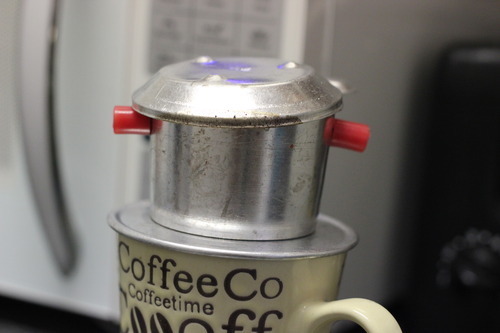 Brewing a cup of Vietnamese coffee is simple and easy. First, place the coffee grounds at the bottom of the cup portion and tamp the grounds firmly with the perforated presser. 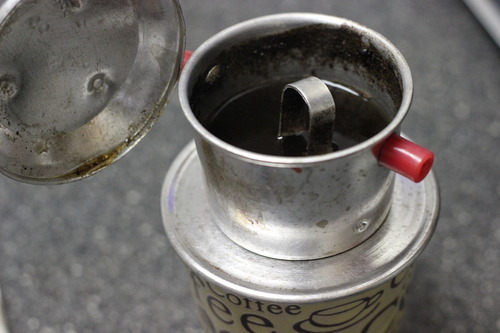 Then, pour boiling water into the canister and slowly refill as much as your caffeine limit allows (wait, there are limits?). The slow drippy process extracts the oils, flavor, and caffeine out of the ground coffee beans to create a dark, dense liquid. Once you’ve got your coffee, don’t start reaching for fresh milk or cream. Vietnamese coffee is usually served with sweet, condensed milk, which is added to the base of the cup before the dripping process. The sweetness of the condensed milk balances the bitter, robust flavors of the robusta beans and stays fresh for a very long time in warm weather (which explains the general lack of fresh milk in Vietnam). At Vietnamese cafes, you’ll usually see tall glasses with long stirring spoons for lightly mixing the two ingredients together. My favorite part is swirling the cream colored milk and dark coffee to create a beautiful mocha color. Now that you’ve got your ca phe sua da (iced coffee) in hand, sit outdoors on a nice day and sip away. Watch the world go by. If there’s anything I’ve learned from being in Vietnam, it’s that in America, we move too fast, too furious, and often forget to enjoy the process. I remember a few times in Vietnam when I craved a cup of American coffee—that stuff sitting in tanks and looks like coffee while not quite tasting like coffee. Now that my Vietnam adventure is over, I wish I was back in that cafe, having what seemed like the best cup of coffee in the world. After I finished typing that last paragraph, I actually became so filled with nostalgia that I stopped and rushed home to break out my phin. As I filled the canister with robusta grounds, I thought of the times I sat on the side of Nguyễn Trãi, watching kids bike from school, elders sell dried shrimp from their carts, and the sun blaze on my skin on hot, sunny days. Drip-drip-drip. I waited for the coffee’s sweet and bold fragrance to fill the air and watched the colors blend to a dark caramel. I closed my eyes and I could imagine the sounds, the smells, the places.